Take a look at the live demo for this template to see the design in action or find for high-resolution sceenshots below. For a limited time, this template will be available at the introductory price of just $2.95! 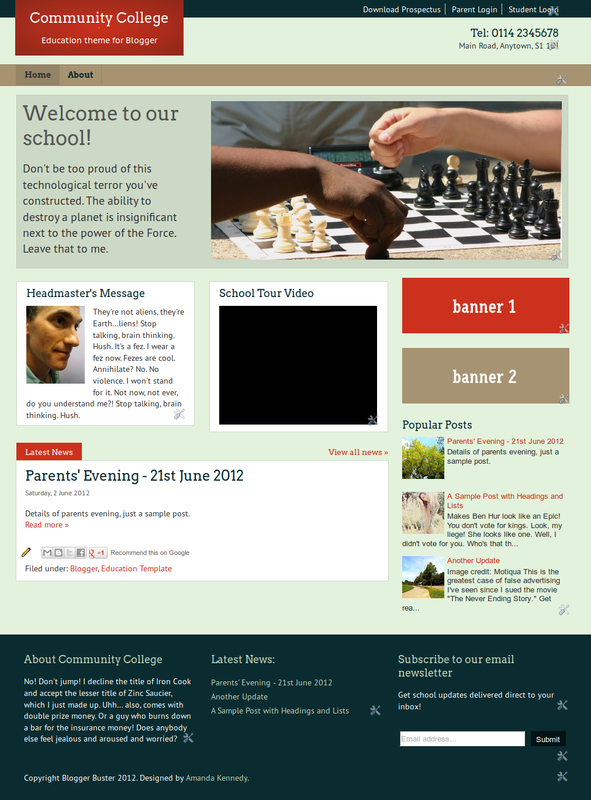 When designing Community College, a key consideration was to allow the user as many customization options as possible. Not only is it possible to change all of the fonts and colors in this template, you can choose to alter the overall width, the width of the sidebar(s) and use any of the layout options available in the Blogger Template Designer. The home page retains the additional gadget sections, and these are automatically adapted in width to any changes you may make to the layout. 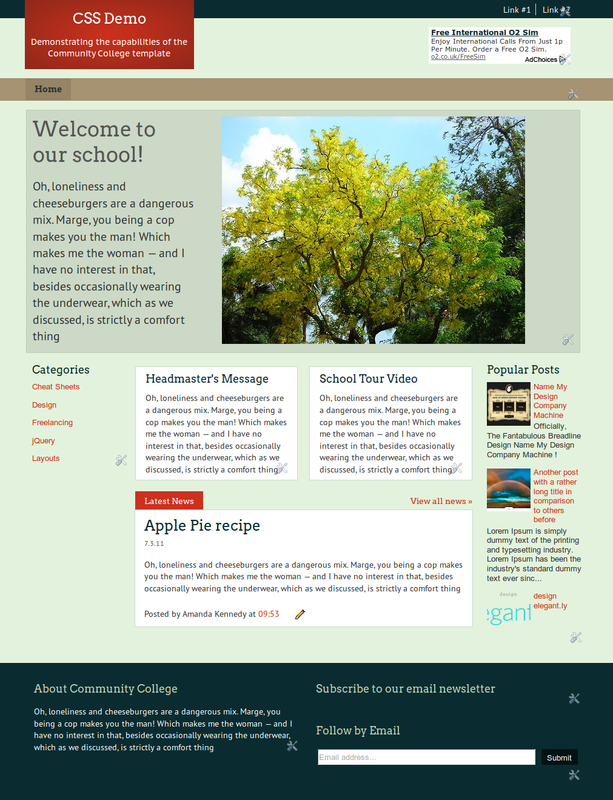 Community College Website Template for Blogger is available to purchase at the low introductory price of just $2.95! Your template will be available to download as soon as payment is processed and is accompanied by comprehensive installation instructions. I'm very pleased with how well this template has turned out, and that the level of customization options makes it an ideal solution for anyone wishing to create a simple web presence using Blogger. However, if you're not 100% happy with your purchase, I offer a money-back guarantee. Just let me know within 7 days of purchase and I'll send out a refund! 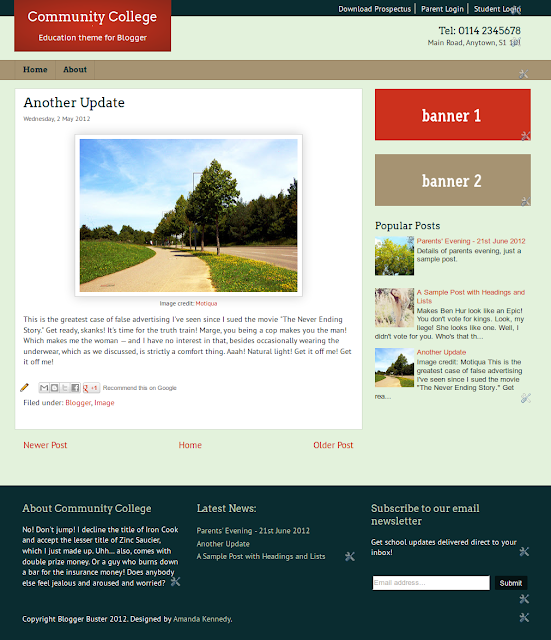 Community College is the first of a series of (affordable) premium templates I plan to release for use on the Blogger platform. As such, I'd really appreciate any feedback about this template so please feel free to leave your comments and suggestions below.